OxiClean is the brand name for a powdered stain-removing cleaner. The cleaner contains sodium percarbonate, soda ash and detergents. Because it does not contain chlorine bleach, it is touted as being safe for a wider variety of materials and surfaces than traditional cleaners. It is fine to use on the majority of carpeted surfaces, but should be tested in an inconspicuous area before it is applied to a broad area of the carpeting. To start, pre-treat the stained area with OxiClean. Mix 1 oz. of OxiClean with 16 oz. of water and spray the solution onto the stained area. Allow the solution to soak in for about five minutes and then blot the area with a wet towel. Blot again with a dry towel to remove excess moisture. 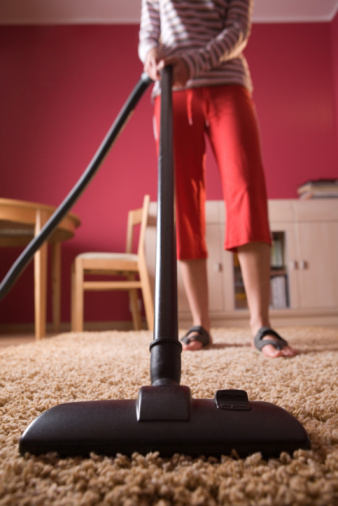 If the stain appears to be faded, treat the area with the steam carpet cleaner as usual. Do not add any OxiClean to the carpet cleaner, as it shouldn't be necessary to remove the stain. Be very cautious when using OxiClean in a steam cleaner. Though the product contains no specific directions for use in a steam cleaner, it should be perfectly fine because it doesn't contain bleach. Add a small scoop (about an ounce) of OxiClean to the hot water compartment of the steam cleaner and stir to combine. Clean the carpet as usual. Make sure to clean the hot water compartment afterward to make sure all traces of OxiClean are removed. Fill the steam cleaner with just hot water and run it over the space again if the solution appears to leave a film.